The SoundMap focused on developing feasible methods that could be implemented within a one year analytical effort. A variety of informed approximations were necessarily applied to enhance computational feasibility and to bridge data gaps. All extrapolations and assumptions made in producing these products have been explicitly documented in methodology summaries. These summaries are intended to assist users in understanding the current status of the data used here, methodologies applied and requirements for producing different or higher resolution products in the future. For this first release, we are providing preliminary mapping products as images with the goal of making the underlying data available in the subsequent releases. Please contact us if you have questions or concerns. Click a region name to examine the sound field mapping products that are available within that region. This noise layer captures the noise due to wind, which leads to breaking waves--- the resulting noise field is often the dominant component in the 200-1000 Hz regime. 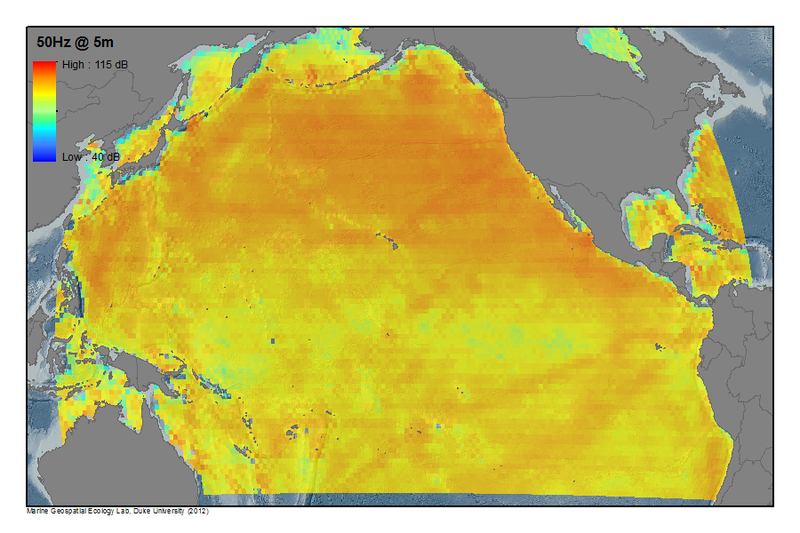 One of the primary and most broadly applicable products developed by the SFWG are the average annual noise levels maps for U.S. EEZ waters of the continental U.S., Hawai’i and Alaska. The purpose is to display modeled predictions of wide-ranging contributions from “chronic” anthropogenic sources of underwater noise. This noise layer captures the noise due to wind, which leads to breaking waves--- the resulting noise field is often the dominant component in the 200-1000 Hz regime. Estimates of the source level density due to wind as a function of wind speed. The usual starting point for estimating wind noise is to simply go to the Wenz curves, which provide predictions of the noise level vs. frequency and wind speed (see Ref. 3). Those curves have been widely used; however, they do not take into account the variation in the environmental conditions. The variation of bottom type in particular can have an important effect. 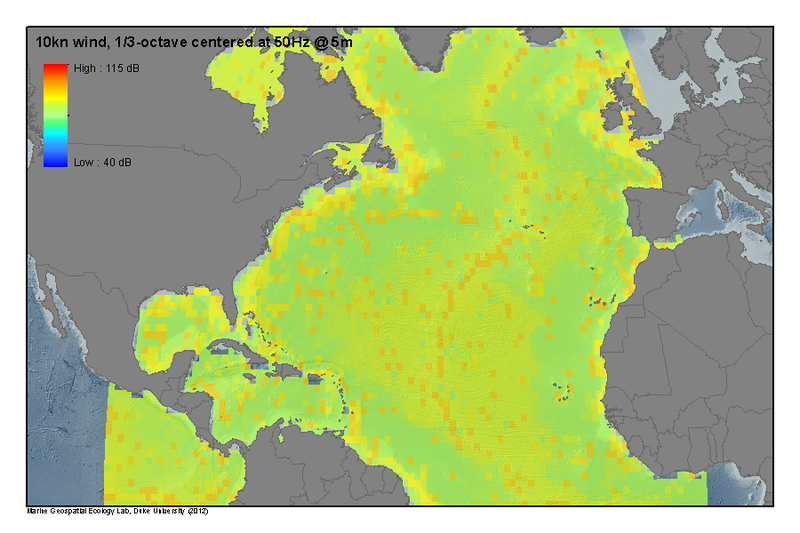 Instead, we incorporated recent work supported by the Office of Naval Research (Marine Mammals and Biological Oceanography Program) to estimate global soundscapes. A key component is the construction of the environmental descriptors1. The next key step was the inclusion of curves for the source level density due to wind. (This is in contrast to the Wenz curves, which try to jump directly to received level and ignore the propagation effects.) We chose models for the source level density based on the work by Kewley2, et al. (see Figure 6 in that reference). Rather than assemble a model of the global wind speed as a function of latitude and longitude, we chose instead to assume a uniform wind speed over the globe and model the noise field for a variety of wind speeds. This latter approach has its pros and cons, but it allows a researcher to use the resulting soundscape in a manner similar to the Wenz curves. That is one can look up an anticipated noise field based on whatever wind speed is of interest for the time of year and location. Noise levels were then calculated for a number of discrete depths and sound frequency bands. Propagation was conducted using Kraken normal node parameters (Porter and Reiss, 19843; 19854). Predicted received levels are expressed as equivalent, unweighted sound pressure level (Lzeq), which is a time-average of sound levels across a specified duration, represented in specific 1-Hz frequency bands at the following frequencies: 50, 100, 200, 400, and 800 Hz; 1/3rd-octave band levels centered on these frequencies were calculated from the modeled spectrum levels. Different geospatial noise map layers are depicted for different receiver depths and frequency bins at either 1x1 degree lat-long or ~10x10km resolution (0.0924 degrees which is 10 km at the equator). Improvements in the underlying environmental parameters used (e.g., ocean bottom-type data) would lead to improved accuracy. Linking the acoustic models to a global forecast of the wind field would be helpful in providing a true synoptic picture of the soundscape. Effects of bubbles, spray, splash, and rain should be included at higher frequencies (above 1 kHz) and other meteorological effects such as lightening strikes should be included in a broadened soundscape layer. 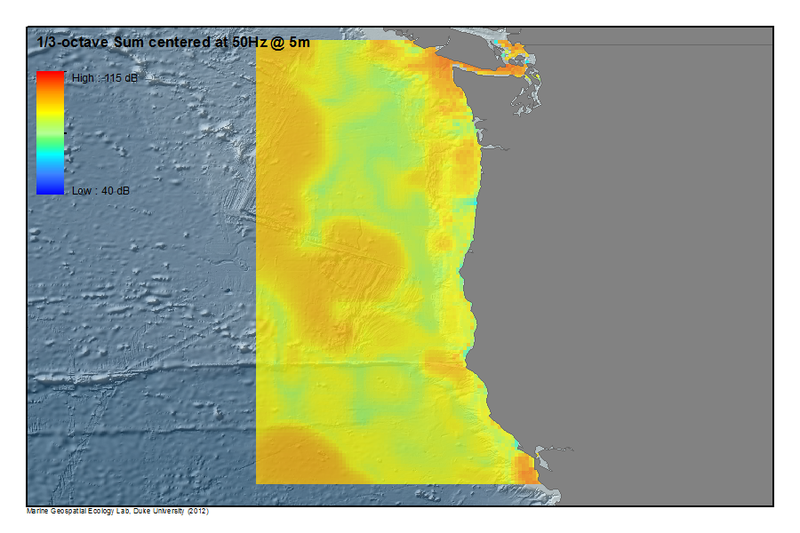 1Bathymetry from SRTM30 (David T. Sandwell, Walter H. F. Smith, and Joseph J. Becker, 2008) and ETOPO2 (U.S. Geological Survey, 2004); Sea surface roughness based on 10-knot wind speed; Seabed from NCEAS conversion of dbSEABED into “hard” and “soft” bottom types (Halpern et al. 2008); sound-speed profiles from WOA “Annual Average” (World Ocean Database 2005. S. Levitus, Ed., NOAA Atlas NESDIS 60, U.S. Government Printing Office, Washington, D.C.); blank areas filled in with data from Database Description for Bottom Sediment (U), 2006, Naval Oceanographic Office Acoustics Division, Stennis Space Center, Mississippi. 2Kewley, D.J. Browning, D.G. and Carey, W.M., Low-frequency wind-generated ambient noise source levels, J. Acoust. Soc. Am. 88(4): 1894-1902 (1990). 3Porter, M.B. and E.L. Reiss. 1984. A numerical method for ocean acoustic normal modes. J. Acoust. Soc. Amer. 76, 244-252. 4Porter, M.B. and E.L. Reiss. 1985. A numerical method for bottom interacting ocean acoustic normal modes. J. Acoust. Soc. Amer. 77, 1760-1767). Provides an example of the sound fields generated by an oil-rig decommissioning in the Gulf of Mexico with ships only (no explosives). 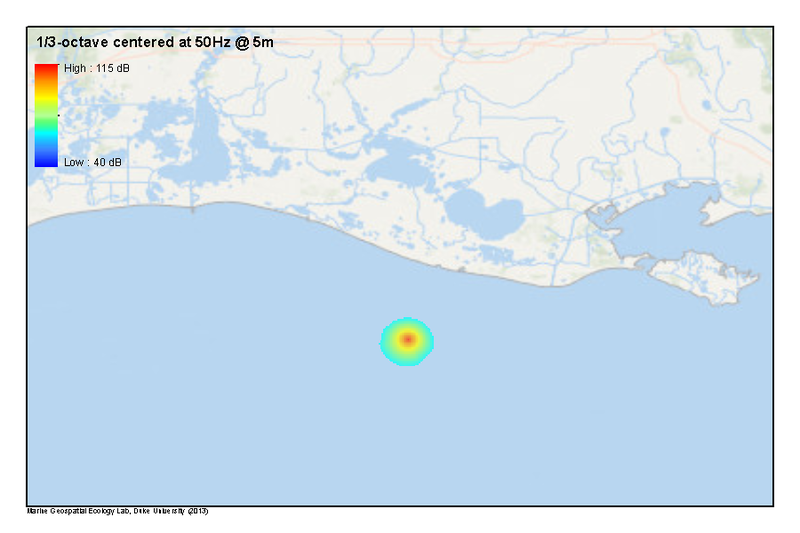 To provide an example of the sound fields generated by an oil-rig decommissioning in the Gulf of Mexico as one of the representative noise event scenarios for SoundMap modeling. The source data used in this event scenario were from the logs submitted to BOEMRE of an actual rig decommissioning that took place in July, 20101. Approximately 3 weeks of dismantling the rig, including 2 episodes of blasting with explosives, were followed by nearly a week of trawling as the final site clearance. Two different activity “states” have been modeled to illustrate the contributions of different activities: 1) Support vessel activity present, with no explosives and 2) Support vessel activity present with explosives. Because the chosen site was quite close to land and the ports were not specified, the ship activities were all modeled as though they occurred directly at the site. These activities include tugging, transport, anchor pulling, and the final trawling. The source levels for the various ship types were assigned from known source levels from similar ships doing similar activities. The durations for these ship activities were taken from the logs, and the duration of various activities were accumulated by type; e.g., any tug moving any barge; which were finally converted to 1 second Leq. The ship activity was modeled2 with a parabolic equation acoustic model (RAM3), and the explosives with a ray model (Bellhop4). The source levels for the explosions were converted from broadband levels to source levels at our 5 frequencies5. Like each of the event scenarios, the oil rig decommissioning event should be recognized as a first-order example of the sound footprints associated with these kinds of offshore activities. Future improvements will include site-specific acoustic parameters of actual decommissioning operations, actual tracks of support vessels, increased spatial resolution, and improvements in the site-specific ocean and sediment-layer sound-speed data. 1Ramona Sanders, BOEMRE, personal communication, 2012. 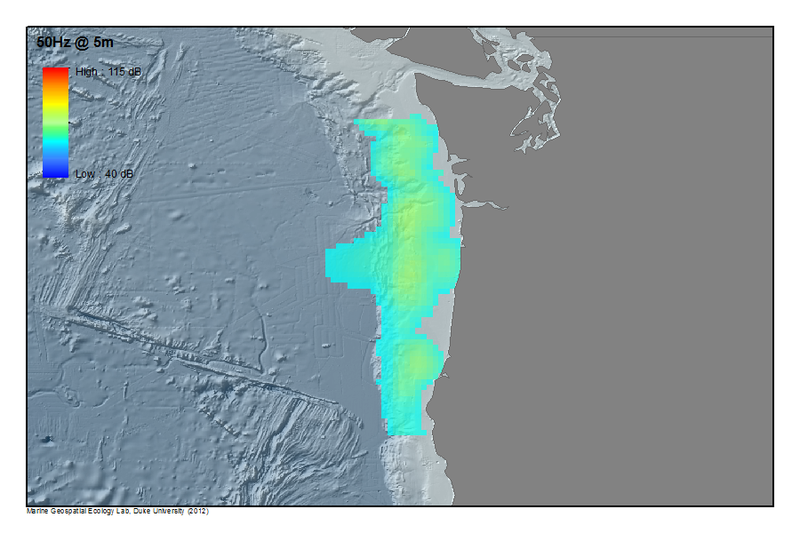 2Bathymetry from Coastal Relief Model, NGDC, NOAA; Sound Speed Profiles from World Ocean Database 2005. S. Levitus, Ed., NOAA Atlas NESDIS 60, U.S. Government Printing Office, Washington, D.C. (“July”); Wind Speed was assumed to be small, resulting in a surface roughness of no more than 0.1 m; sediment properties were defined as mud, with “hard-bottom” data from Halpern et al. 2008 defined as shell fragments. 3Mike Collins, User's Guide for RAM versions 1.0 and 1.0p. 4Homer P. Bucker and Michael B. Porter, "Gaussian Beams and 3-D Bottom Interacting Systems", in Ocean Seismo-acoustics, ed. Tuncay Akal and Jonathan Berkson, Plenum Press, New York (1986); Michael B. Porter and Homer P. Bucker, " Gaussian Beam Tracing for Computing Ocean Acoustic Fields", J. Acoust. Soc. Am. 82(4):1349-1359 (1987); Michael B. Porter and Yong-Chun Liu,"Finite-Element Ray Tracing", Proceedings of the International Conference on Theoretical and Computational Acoustics, Eds. D. Lee and M. H. Schultz, pp. 947-956, World Scientific (1994); http://www.hlsresearch.com/oalib/Rays. 5(a) Underwaternoise.org.uk; (b) Joseph G. Connor, Jr., Underwater Blast Effects from Explosive Severance of Offshore Platform Legs and Well Conductors, NAVSWC TR 90-532, 1990; (c) Arons, A. B., Slifko, J. P., and Carter, A. (1948). "Secondary pressure pulses due to gas globe oscillation in underwater explosions I. Experimental data," J. Acoust. Soc. Am. 20(3), 271–276. 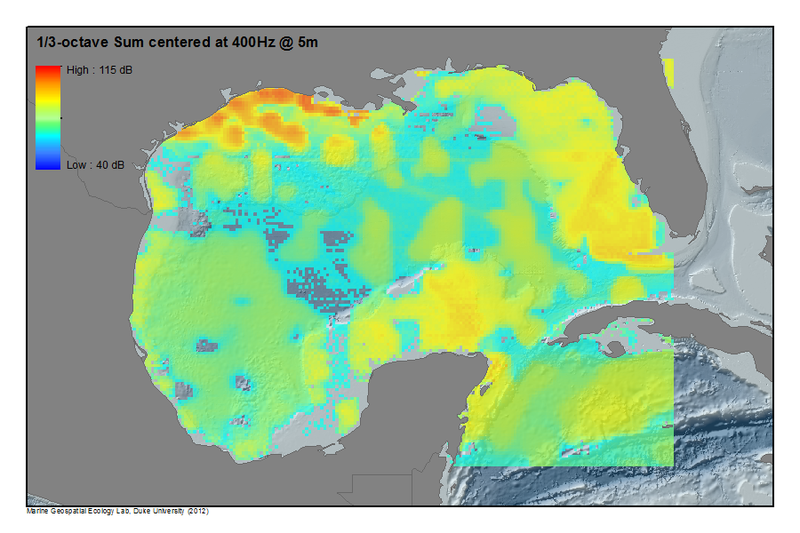 Provides an example of the sound fields generated by an oil-rig decommissioning in the Gulf of Mexico. To provide an example of the sound fields generated by an oil-rig decommissioning in the Gulf of Mexico as one of the representative noise event scenarios for SoundMap modeling. Two different activity “states” have been modeled to illustrate the contributions of different activities: 1) Support vessel activity present, with no explosives and 2) Support vessel activity present with explosives. The source data used in this event scenario were from the logs submitted to BOEMRE of an actual rig decommissioning that took place in July, 20101. Approximately 3 weeks of dismantling the rig, including 2 episodes of blasting with explosives, were followed by nearly a week of trawling as the final site clearance. The pressure fields due to individual noise sources were summed incoherently, that is, their intensities were added to compute cumulative fields. These results were then converted to decibel values. These noise layers display modeled predictions of wide-ranging contributions from “chronic” anthropogenic sources of underwater noise, specifically large commercial fishing vessels. 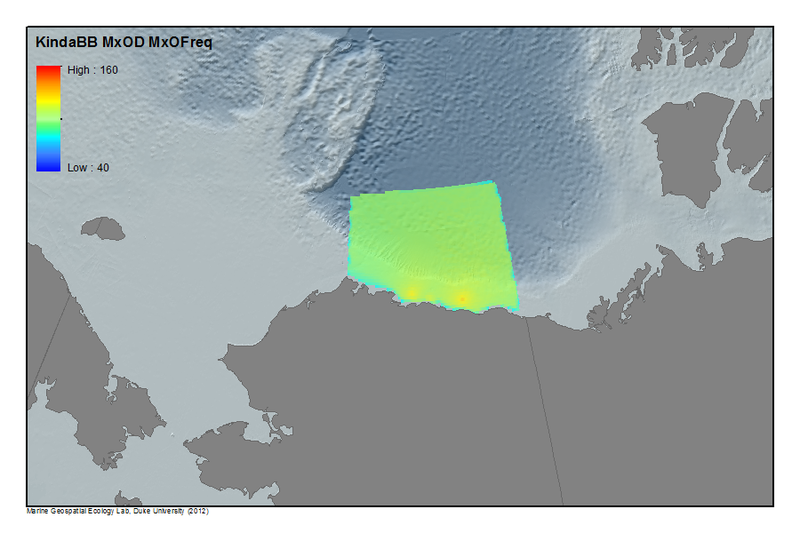 Tracks were overlaid within a 0.1 x 0.1 degree grid covering the latitudinal and longitudinal span of the dataset, with the total accumulated vessel time in each cell summed for SFWG noise modeling for large commercial vessels on approximately the same spatial scale. See the section "Annual Average Ambient Noise Modeling Methodology: Global Shipping" for more information. 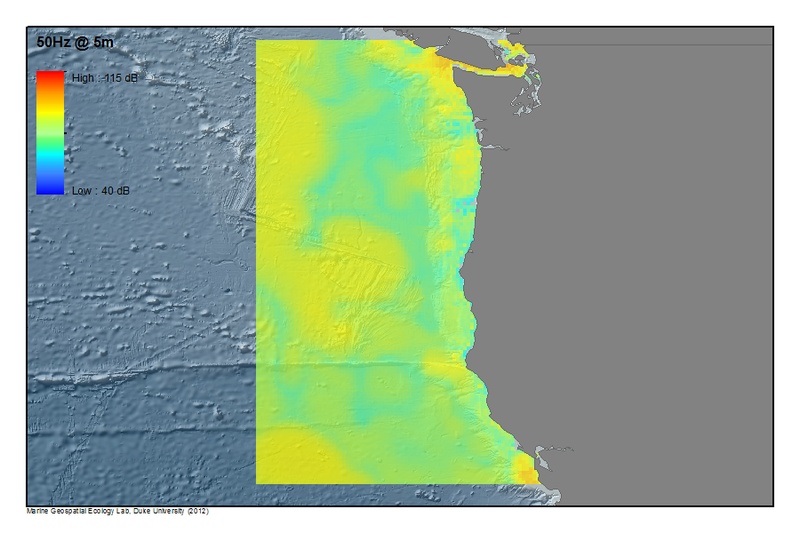 This database represents the spatial distribution and density of large commercial fishing vessels used as a proxy for their distribution as underwater noise sources in SoundMap modeling. 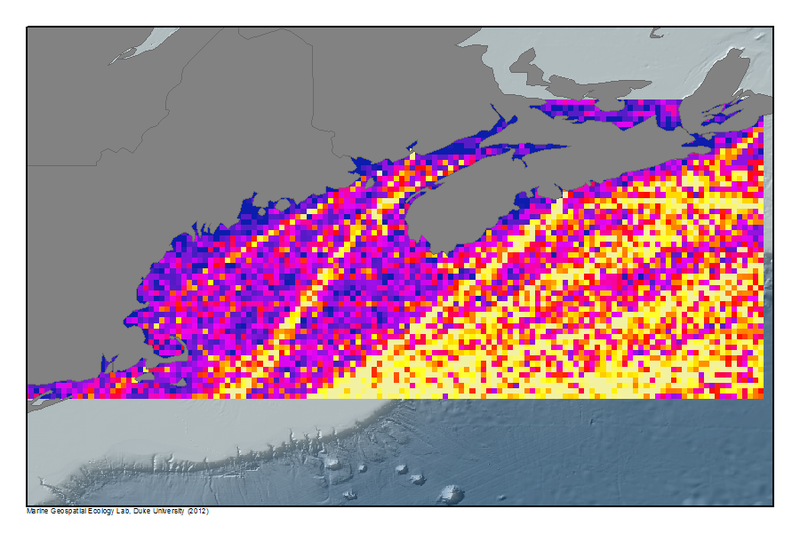 To derive a dataset representing the approximate spatial distribution and density of fishing vessels operating in fairly concentrated regions of Alaska that are relatively less developed/populated areas than most of the US EEZ. The resulting data are used as a proxy for the distribution of these vessel classes as underwater noise sources in the modeling of seasonal ambient noise in these areas. NOAA’s Alaska Fisheries Science Center (AKFSC) maintains a GroundFish Observer Database for fisheries in the Gulf of Alaska, Bering Sea/ Aleutian Islands and off the NW coast of the U.S1. Time and date, and locations of fishing gear deployment and retrieval are recorded by NOAA Fisheries Observers onboard the vessels for a period from late 2006 through mid-2011 with over 220,000 entries from 327 vessels. 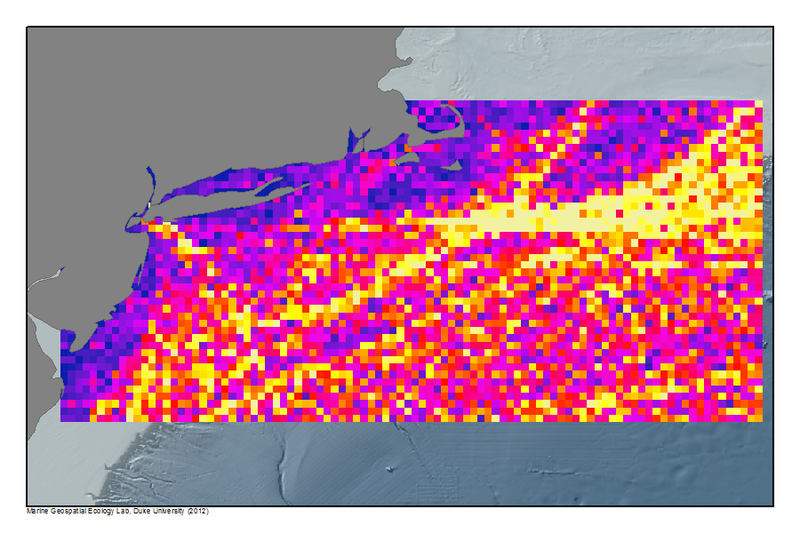 A number of simplifying assumptions were made in deriving this dataset, including that the NOAA Groundfish Observer data of gear deployment & recovery locations is generally representative of the locations and durations of fishing vessel traffic, that observer data from vessels of less than 125ft (30% coverage) is representative of the rest of the fleet without observer coverage, that the accumulated time in cells from these vessels multiplied by a factor of 3.33 to extrapolate to 100% coverage is appropriate, and that the various vessel classes are broadly represented by a nominal sound source signature2. One acknowledged limiting factor is that, accumulated vessel presence time that occurred in cells with less than 3 vessels were removed from those cells and added to the closest cell with 3 or more vessels, in order to meet NOAA Fisheries confidentiality requirements governing the use of this observer database. 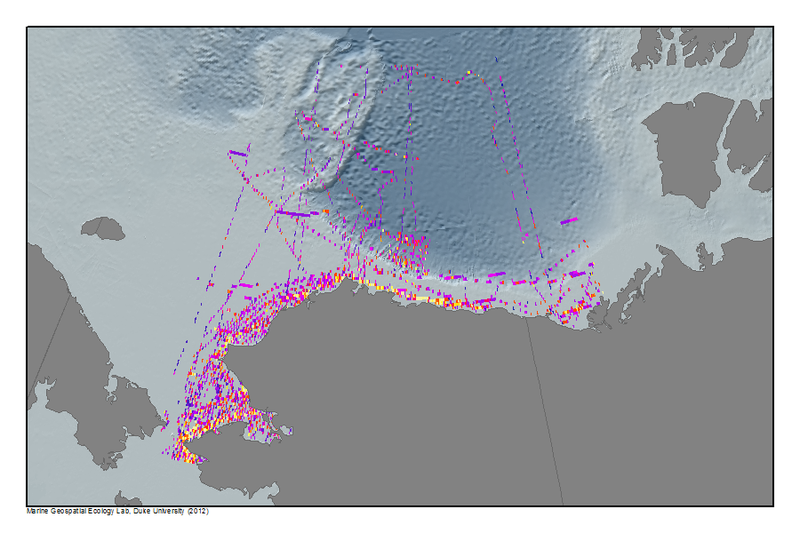 Locations of all fishing vessel activity were used to construct “tracks” of fishing activity for each cruise on individual vessels. 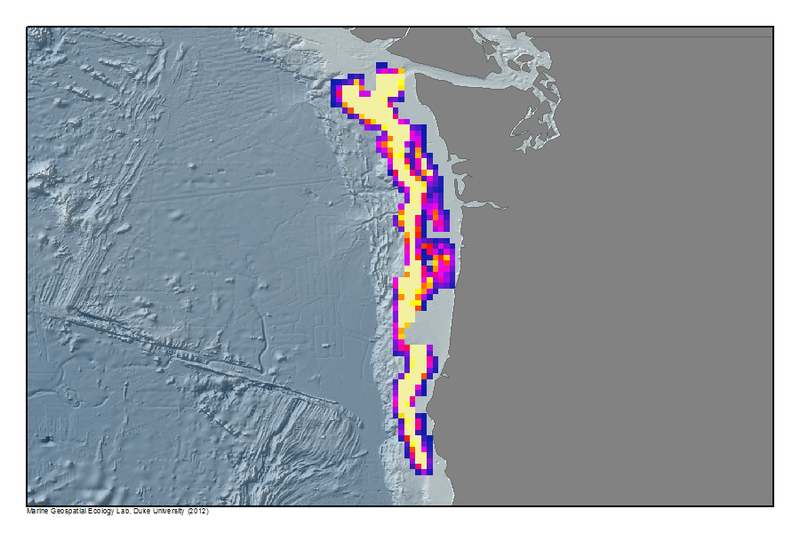 Tracks were overlaid within a 0.1 x 0.1 degree grid covering the latitudinal and longitudinal span of the dataset, with the total accumulated vessel time in each cell summed for SFWG noise modeling on approximately the same spatial scale. Future improvements would include better quantification and empirical data on actual traffic patterns with more detailed information on the use patterns and source levels and spectral signatures of the range of fishing vessels. The incorporation of ports of call to complete ‘pseudo-tracks’ from port, to fishing grounds, and back to port, would also be an important progression; currently only fishing grounds are represented. 2William M. Carey and Richard B. Evans, "Ocean Ambient Noise Measurement and Theory", Springer 2011. pp 115 -116. 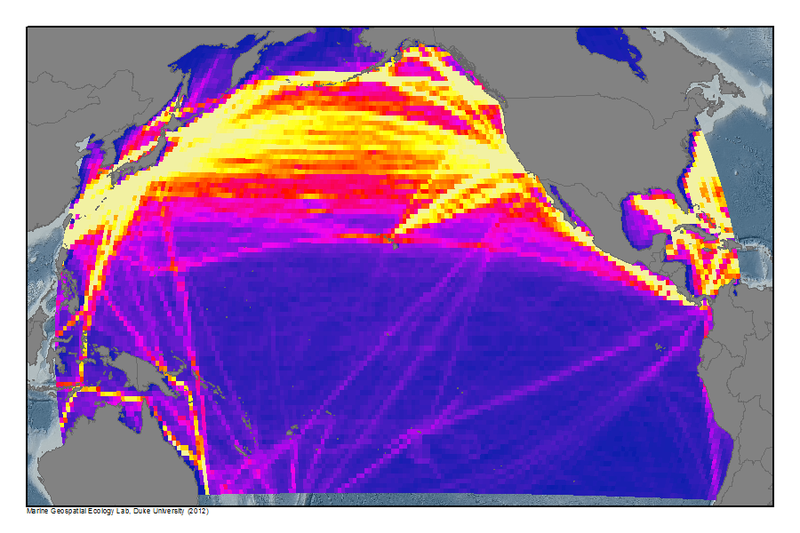 This database represents the spatial distribution and density of global shipping traffic used as a proxy for the distribution of large commercial ships as underwater noise sources in SoundMap modeling. The predominant anthropogenic source of underwater noise on a global scale is large commercial ships. Consequently, while other data sources are used in SoundMap acoustic modeling to determine annual average contributions of anthropogenic noise (e.g., passenger, fishing, offshore service vessels), this was arguably the most critical source of noise to accurately represent. The dataset used here for modeling this contribution to overall ambient noise was a global layer of the spatial distribution and density of shipping traffic used as a proxy for the distribution of large commercial ships acting as underwater noise sources. 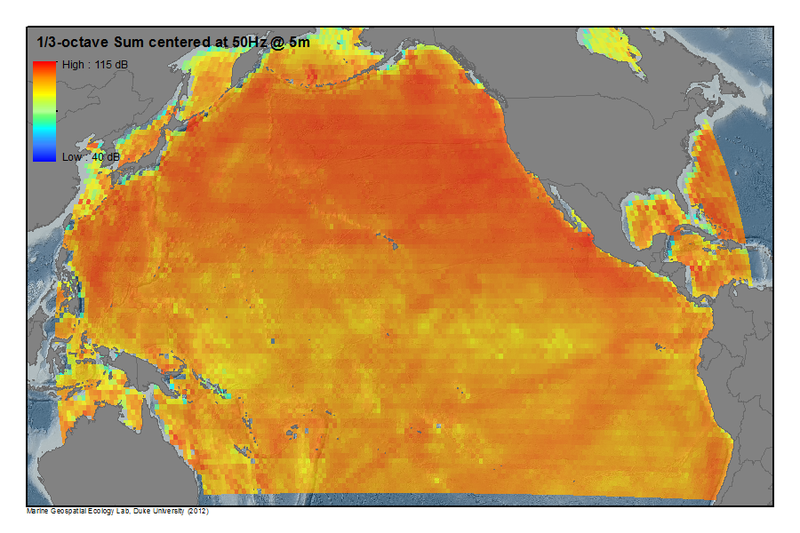 The data used to represent the average annual geospatial distribution of large commercial ships (specifically cargo ships and tankers >500 GT) derive from the World Meteorological Organization Voluntary Observing Ships Scheme (VOS). The specific data applied were collected from Oct 2004 to Sept 2005 (as reported in Halpern et al., 2008). In applying the VOS data to the SFWG modeling, it is acknowledged that this is a voluntary reporting system and that applying these data requires certain assumptions. It was assumed that ships travel in straight lines between individual reporting locations and do not transit across land. It was also assumed that these data were reasonable approximations of annual averages of spatial distribution patterns that could be extrapolated from 2004-05 to 2010-11, with density corrections applied based on changes in the total global fleet of large ships. The original data were lat-lon point locations converted to tracks and summed over a 1km grid. 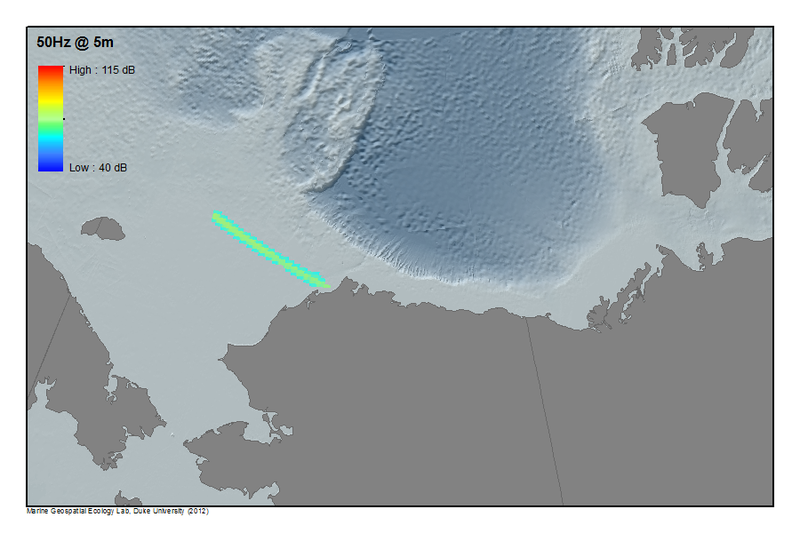 This was resampled to ~10km resolution (0.0924 degree lat-lon) resolution to normalize sampling error in the track data. 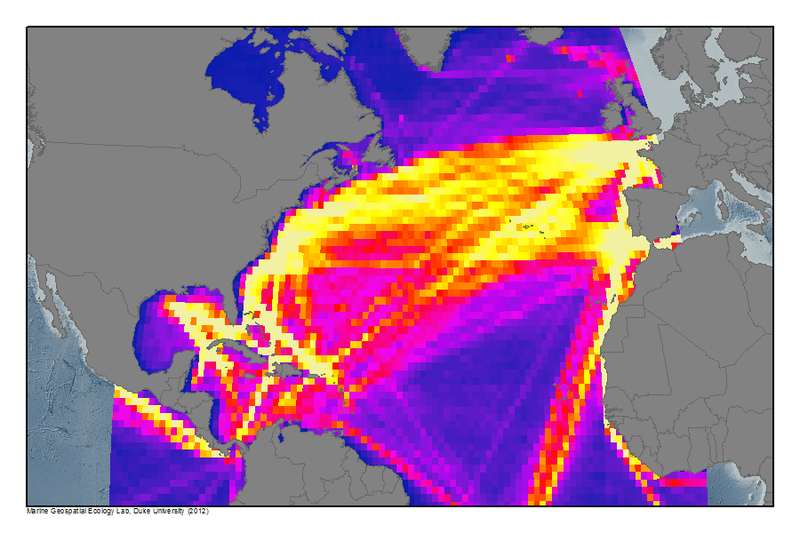 The output is a ~10km resolution grid representing global ship traffic, which is used as the basis for average annual global shipping distribution and density in the SFWG annual ambient noise modeling and consequently as the main component of background acoustic state in the noise event scenarios. 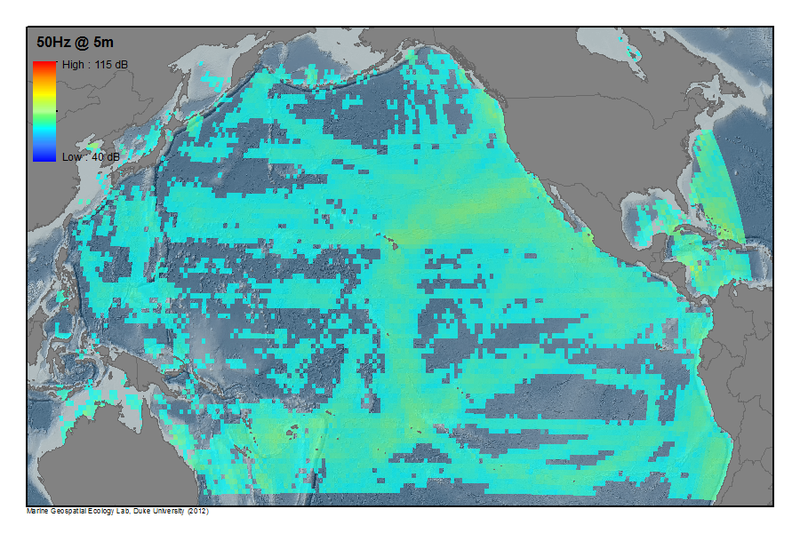 For the purposes of the current SFWG acoustic modeling, the overall density and distribution of ship tracks derived from the 2004-05 VOS data is believed to be a reasonable representation for the annual average distribution and density of large commercial vessels on a global scale. 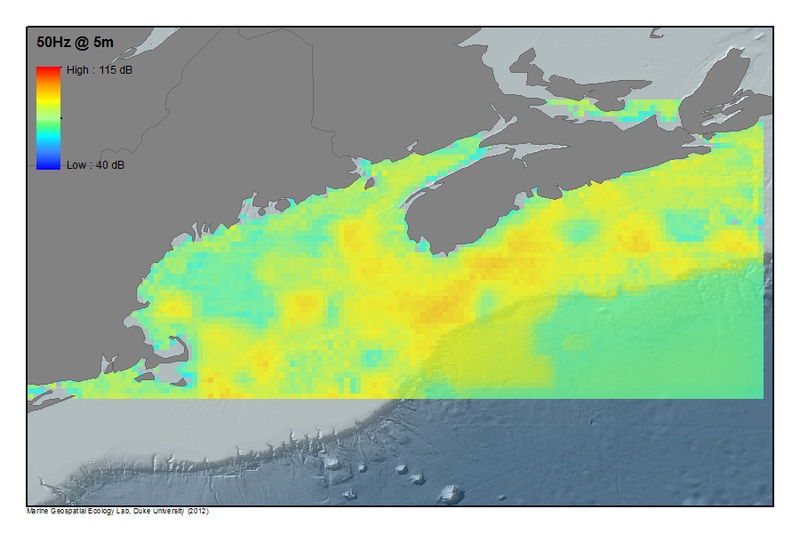 We also envision a number of future steps that will continue to improve the underlying data, including better resolution of the spatial patterns of ship movement from voluntary reporting schemes, better information on ship distribution near shore (e.g., from AIS transponders), and more detailed information on class-specific acoustic signatures for use in acoustic modeling. 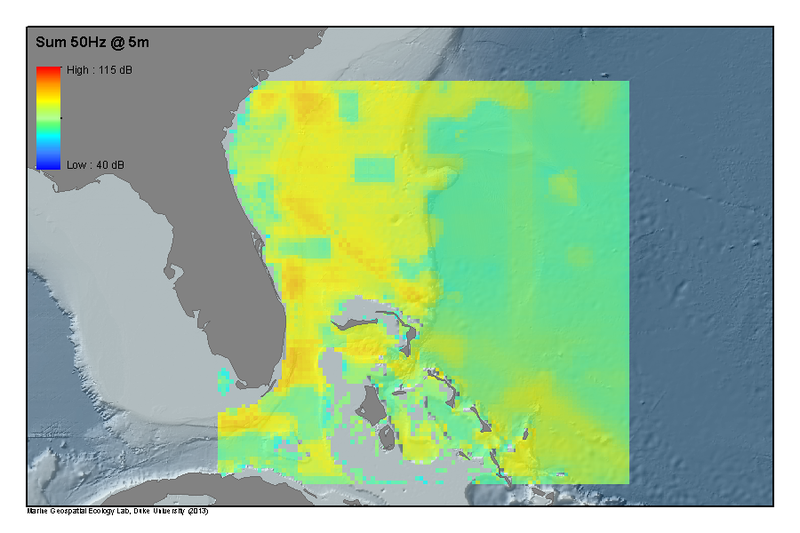 This database represents the spatial distribution and density of passenger vessels (cruise ships and cruise ferries) used as a proxy for their distribution as underwater noise sources in SoundMap modeling. 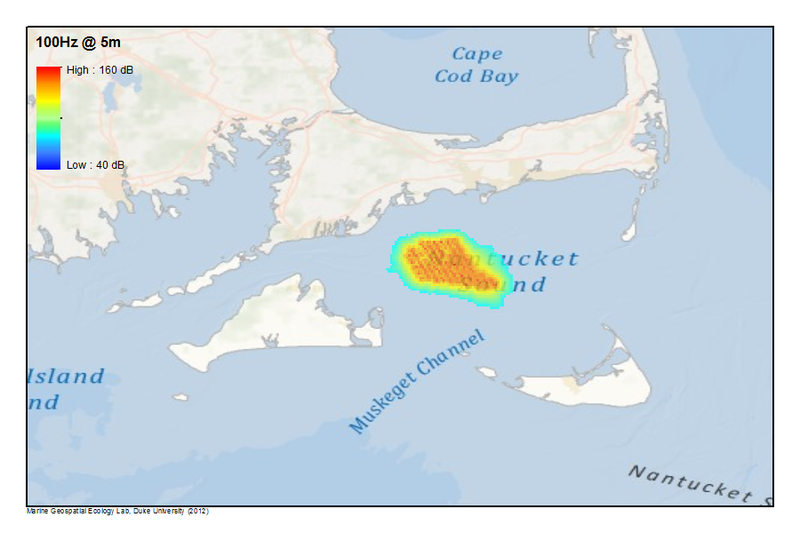 To derive a dataset that represents the spatial distribution and density of one component of shipping traffic – passenger vessels (cruise ships and cruise ferries) – for use in the modeling of the average contribution of these vessels to overall low-frequency ambient noise. Passenger vessels were treated separately because they have a different spatial distribution and pattern of behavior than the rest of the commercial fleet. This data layer is based on Automatic Identification System (AIS) and World Meteorological Organization Voluntary Observing Ships Scheme (VOS) data from 2008-2010, compiled by the vessel tracking website, www.sailwx.info. These data were compiled and are applied in SoundMap modeling with a number of assumptions and caveats. It is acknowledged that the tracks of individual passenger vessels certainly differ from the average distributions represented here, that AIS data is limited in the geographic area covered, and that VOS is a voluntary reporting system. It was assumed that ships travel in straight lines between individual reporting locations and do not transit across land. It was also assumed that these data were reasonable approximations of annual averages of spatial distribution patterns that could be extrapolated from 2008-2010 to 2010-11 with density corrections applied based on changes in the total global fleet of passenger vessels. 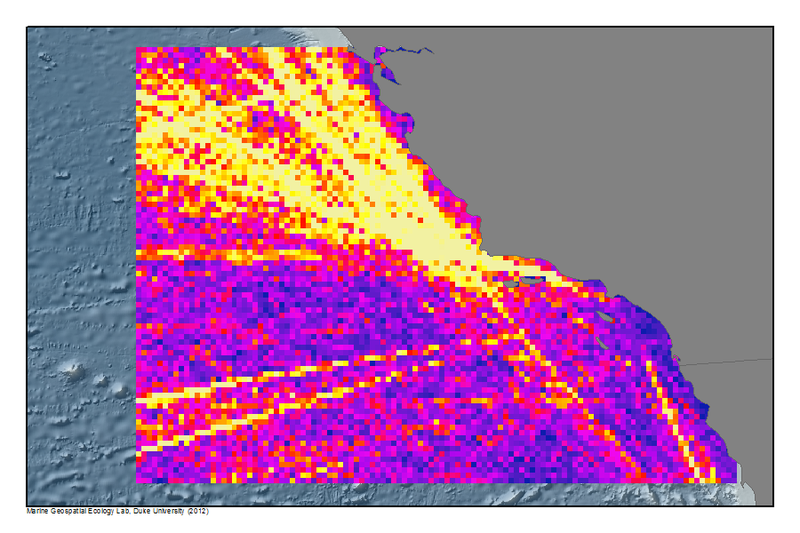 The original data were lat-lon point locations converted to tracks and summed over a 0.1° x 0.1° lat-lon (~100 km2 at the equator) grid.The output is a ~10km resolution grid representing global passenger vessel traffic, which is used as the basis for the average annual global distribution and density of passenger vessels in SoundMap annual ambient noise modeling and consequently as a component of the background acoustic state in the noise event scenarios. For the purposes of the current SoundMap acoustic modeling, the overall density and distribution of ship tracks derived from the the AIS and VOS data is believed to be a reasonable representation for the annual average distribution and density of large commercial passenger vessels on a global scale. A number of future steps are envisioned that will continue to improve the underlying data, including better resolution of the spatial patterns of ship movement from voluntary reporting schemes, better information on ship distribution near shore from AIS transponders, and more detailed information on class-specific acoustic signatures for use in acoustic modeling. 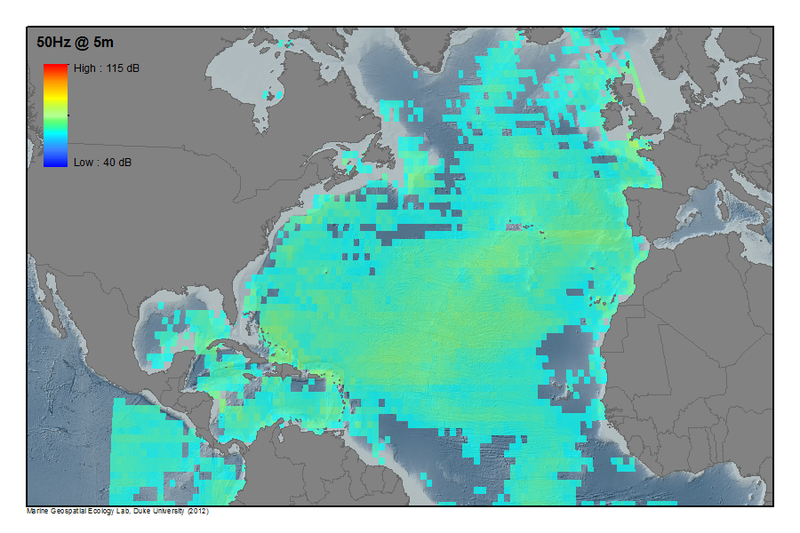 These noise layers display modeled predictions of wide-ranging contributions from “chronic” anthropogenic sources of underwater noise, specifically large commercial vessels. 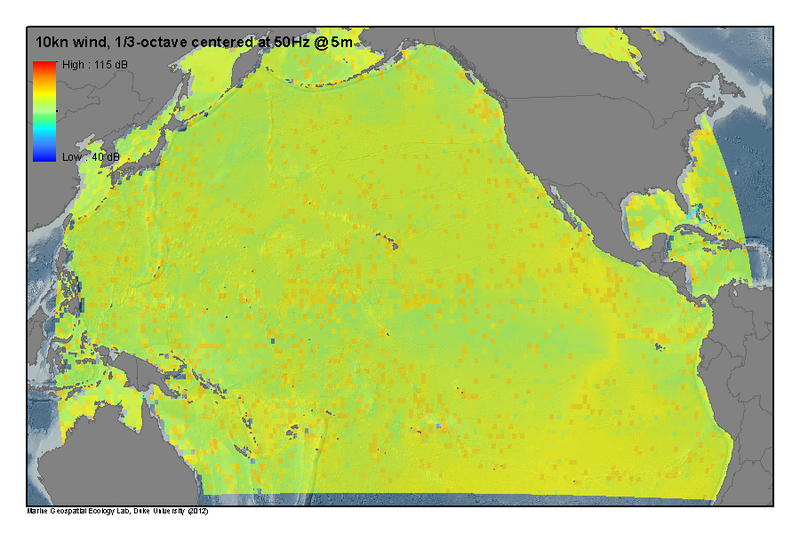 One of the primary and most broadly applicable products developed by SoundMap are the average annual noise levels maps for U.S. EEZ waters of the continental U.S., Hawai’i and Alaska. The purpose is to display modeled predictions of wide-ranging contributions from “chronic” anthropogenic sources of underwater noise, for this noise layer specifically large commercial vessels. Geospatial distribution from VOS data and number of large commercial vessels (described in global shipping source data summary). Environmental descriptors1 and the distribution, density, and acoustic characteristics of commercial vessels2 were used to develop first-order estimates of anthropogenic noise levels for a number of discrete depths and sound frequency bands. Propagation was conducted using Kraken normal node parameters (Porter and Reiss, 19843; 19854). Predicted received levels are expressed as equivalent, unweighted sound pressure level (Lzeq), which is a time-average of sound levels across a specified duration, represented in specific 1-Hz frequency bands at the following frequencies: 50, 100, 200, 400, and 800 Hz; 1/3rd-octave band levels centered on these frequencies were calculated from the modeled spectrum levels. The averaging time utilized considered appropriate timescales for the activities of interest, in this case annual averages for the geospatial distribution of large commercial vessels. Different geo-spatial noise map layers are depicted for different receiver depths and frequency bins at either 1° x 1° (~10000 km2 at the equator) or 0.1° x 0.1° lat-lon (~100 km2 at the equator) resolution. 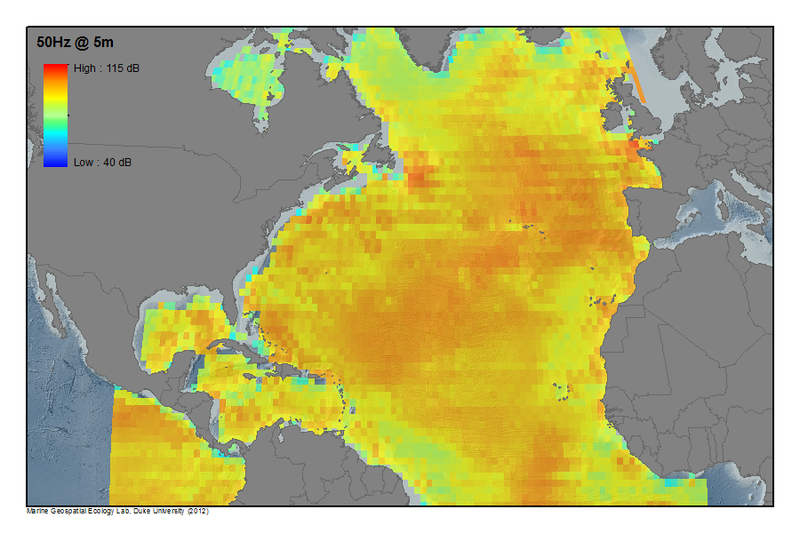 Improvements in the underlying environmental parameters used (e.g., ocean bottom-type data) and improved spatio-temporal resolution on the geospatial distribution of large ships are seen as important developments that will improve the modeling of the annual average contribution of large commercial vessels to low frequency ocean noise. 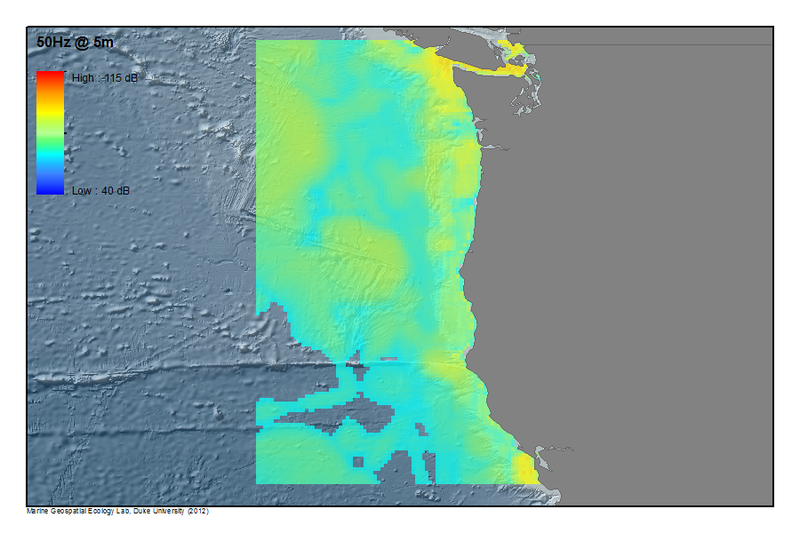 1Bathymetry from SRTM30 (David T. Sandwell, Walter H. F. Smith, and Joseph J. Becker, 2008) and ETOPO2 (U.S. Geological Survey, 2004); Sea surface roughness based on 10-knot wind speed; Seabed from NCEAS conversion of dbSEABED into “hard” and “soft” bottom types (Halpern et al. 2008); sound-speed profiles from WOA “Annual Average” (World Ocean Database 2005. S. Levitus, Ed., NOAA Atlas NESDIS 60, U.S. Government Printing Office, Washington, D.C.); blank areas filled in with data from Database Description for Bottom Sediment (U), 2006, Naval Oceanographic Office Acoustics Division,?Stennis Space Center, Mississippi. These noise layers display modeled predictions of wide-ranging contributions from “chronic” anthropogenic sources of underwater noise, specifically passenger vessels (cruise ships and cruise ferries). To display modeled predictions of wide-ranging contributions from “chronic” anthropogenic sources of underwater noise, for this noise layer specifically passenger vessels (cruise ships and cruise ferries). Geospatial distribution of cruise ships and ferries from Automatic Identification System (AIS) and World Meteorological Organization Voluntary Observing Ships Scheme (VOS) data from 2008-2010 (described in passenger vessel source data summary). Environmental descriptors1 and the distribution, density, and acoustic characteristics of cruise ships and ferries2were used to develop first-order estimates of anthropogenic noise levels for a number of discrete depths and sound frequency bands. Propagation was conducted using Kraken normal node parameters (Porter and Reiss, 19843; 19854). Predicted received levels are expressed as equivalent, unweighted sound pressure level (Lzeq), which is a time-average of sound levels across a specified duration, represented in specific 1-Hz frequency bands at the following frequencies: 50, 100, 200, 400, and 800 Hz; 1/3rd-octave band levels centered on these frequencies were calculated from the modeled spectrum levels. The averaging time utilized considered appropriate timescales for the activities of interest, in this case annual averages for the geospatial distribution of passenger vessels. Different geo-spatial noise map layers are depicted for different receiver depths and frequency bins at either 1° x 1° (~10000 km2 at the equator) or 0.1° x 0.1° lat-lon (~100 km2 at the equator) resolution. 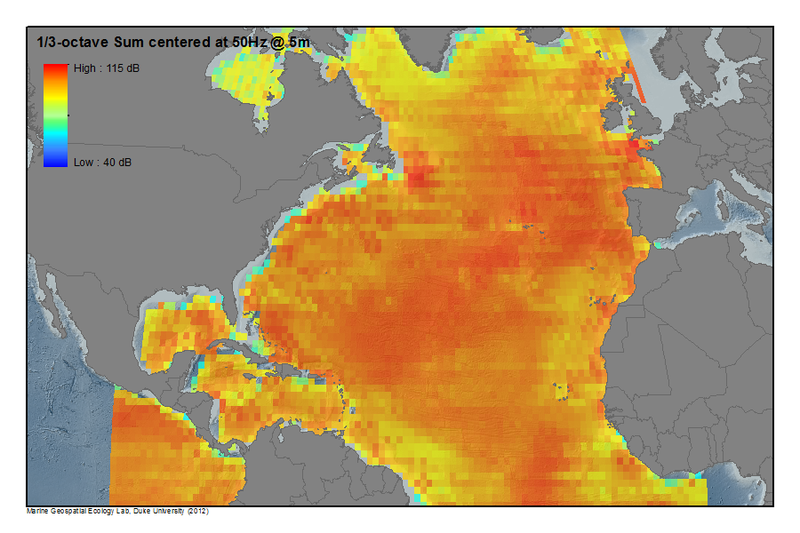 Improvements in the underlying environmental parameters used (e.g., ocean bottom-type data) and improved spatio-temporal resolution on the geospatial distribution of cruise ships and ferries are seen as important developments that will improve the modeling of the annual average contribution of these vessels to low frequency ocean noise. 2Four basic ship types, based on length categories, have been assigned source level curves in previous modeling (ANDES, Renner 1986; Carey and Evans 2011). These length categories are 18-120m, 120-200m, 200-320m, and >320m; ancillary data were used to assign the ships into these length bins with nominal source levels. To derive a dataset representing the temporal and spatial distribution of deep-imaging, low frequency, high intensity surveys used by industry and the Federal Government primarily for assessing the oil and gas potential of offshore (outside state waters) areas in the Gulf of Mexico (GoMex). 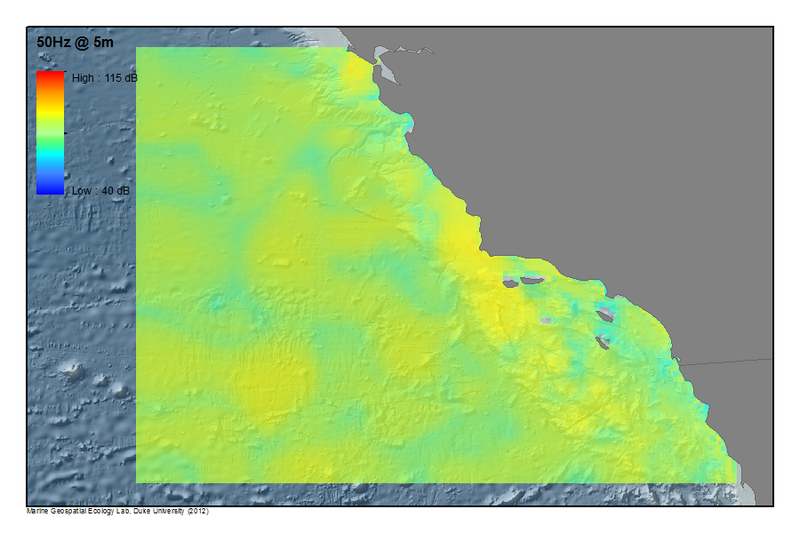 The resulting data on the distribution of these underwater noise sources are used in the SFWG modeling of ambient noise in the GoMex for the duration of each survey. Processing and approval of exploration permits are responsibilities of the Resource Evaluation Office of Bureau of Ocean Energy Management (BOEM). Consequently, detailed information on the periods of operation and navigational track lines of 2D and 3D seismic surveys are provided to BOEM as a condition of these authorizations. 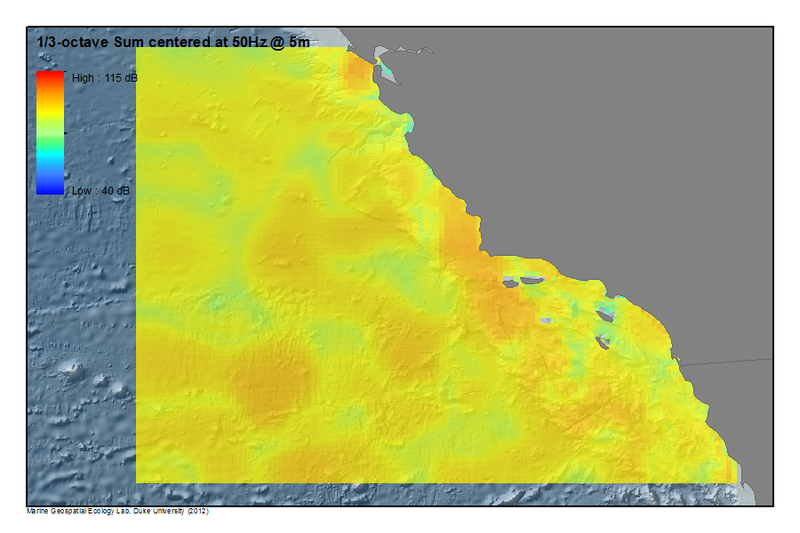 Based on detailed navigation files, the spatial and temporal distribution of 16 full-scale 2D and 3D seismic survey operations in the GoMex during CY2009 were provided by BOEM to the SFWG as a representative dataset of seismic survey operations for a nominal annual period. A number of simplifying assumptions were made in the derivation and application of this dataset, including that both 2D and 3D surveys are uniform in patterns of source activation, that a nominal source level based on a typical array volume and configuration may be used to represent all surveys, and that vessel navigation during surveys is exclusively for the purposes of deep-focused seismic. Polygonal data sets for defining 3D surveys and linear data sets submitted for 2D surveys were assembled by BOEM. The resulting geospatial distribution of these 2D and 3D surveys were then used to model potential sound distribution, given these assumptions, produced by air gun arrays over areas in GoMex during the period of each survey period. The current dataset includes only full-scale, deep-focus seismic surveys in offshore exploration areas with information reported to BOEM. Additional surveys of smaller scale are known to occur for other purposes and some on-lease deep and high resolution seismic surveys are unpermitted and not captured in dataset; the current dataset also does not reflect seismic surveys for scientific research or those conducted in state waters. Additional analysis could be expanded to include these additional noise sources, to include more survey-specific information on airgun array parameters (e.g., survey specific source output levels, directivity and shot patterns), and the operational noise of vessels associated with surveys. 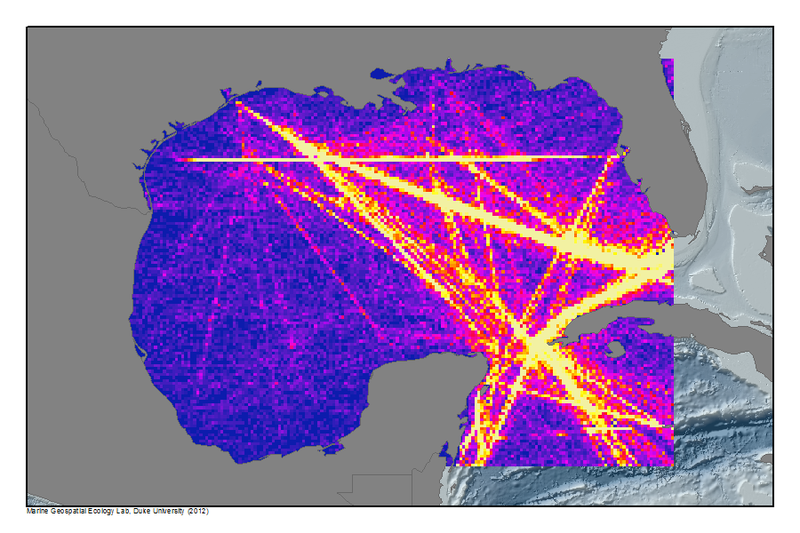 This dataset represents the approximate spatial distribution and density of service vessels transiting to and from offshore oil platforms in the Gulf of Mexico (GoMex). 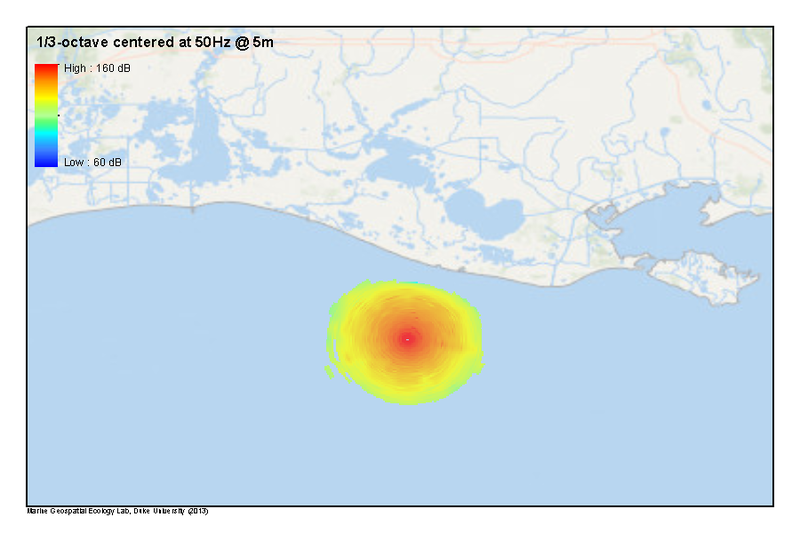 To derive a dataset representing the approximate spatial distribution and density of service vessels transiting to and from offshore oil platforms in the Gulf of Mexico (GoMex). 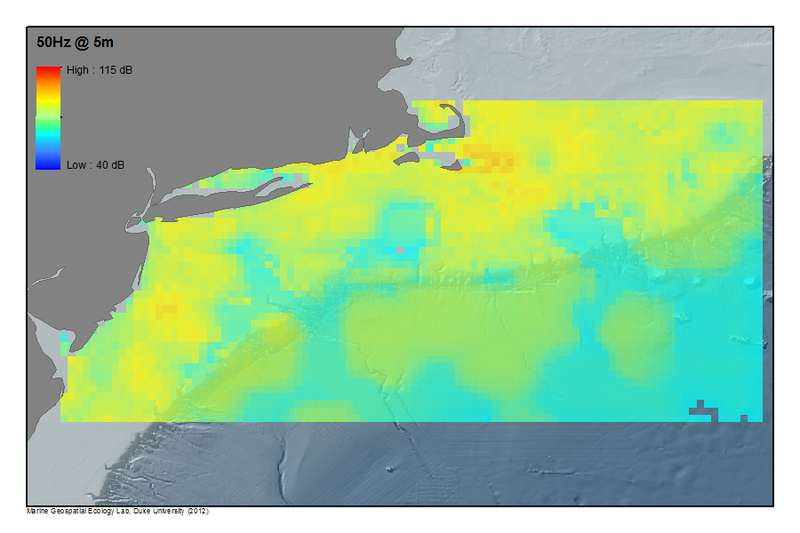 The resulting data are used as a proxy for the distribution of these vessel classes as underwater noise sources in the modeling of annual ambient noise. With input from the Bureau of Ocean Energy Management (BOEM), the location of offshore rigs in the GoMex was determined1 and the approximate routing and timing of service vessel activity was derived from available information2. BOEM reports projecting service vessel traffic per rig from 2007-12 and extrapolations from currently operating production rigs/ports were used to derive an annual average density and distribution. A number of simplifying assumptions were made in deriving this dataset, including that support vessels visit one rig per trip, support vessels begin and end trips at closest port. Measured acoustic characteristics of rig supply vessels from other locations were used as a surrogate to describe acoustic source characteristics of the GoMex supply vessel traffic3. The lat-lon point sample positions for current production platforms in the GoMex and vessel traffic were modeled between these locations using approximations of traffic per rig from BOEM projections. 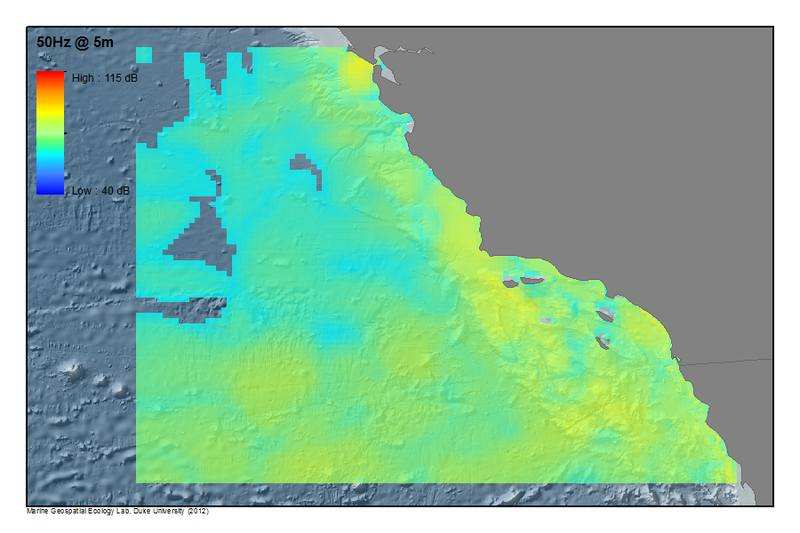 The output was a 0.1° x 0.1° lat-lon (~100 km2 at the equator) grid representing the average annual distribution and density of service vessels. This was subsequently used as the basis for SoundMap modeling of average annual contribution of these human noise sources to the low frequency ambient noise in the GoMex and consequently as the background acoustic state in the GoMex rig decommissioning noise event scenario. For the purposes of the current SoundMap acoustic modeling, the overall density and distribution of GoMex service vessels for offshore oil facilities is believed to be a reasonable representation for annual average patterns of operation4. Future improvements would integrate additional information in a number of areas, including better quantification and empirical data on vessel traffic (ports, number of trips, platforms visited per trip, size class of vessels visiting various rigs, crew transport vessels versus supply vessels), and source levels and spectral signatures of the range of ships servicing rigs. 4Results appear generally consistent with modeled results of service vessel traffic in the GoMex by: Kaiser, M.J. 2010. An integrated systems framework for service vessel forecasting in the Gulf of Mexico. Energy 35(7), 2777-2795. 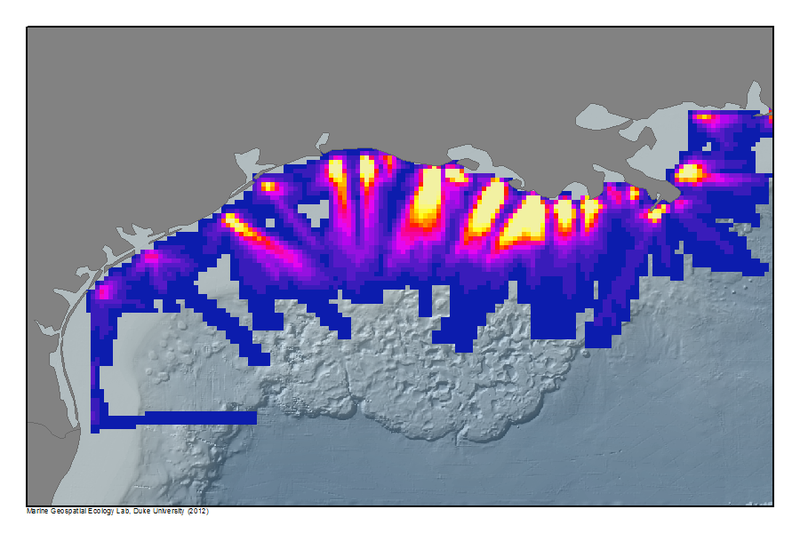 This noise layer depicts the average annual contribution of seismic surveys using airgun arrays to low frequency anthropogenic noise in the Beaufort and Chukchi Seas off the north slope of Alaska. To model the average annual contribution of seismic surveys using airgun arrays to low frequency anthropogenic noise in the Beaufort and Chukchi Seas off the north slope of Alaska. 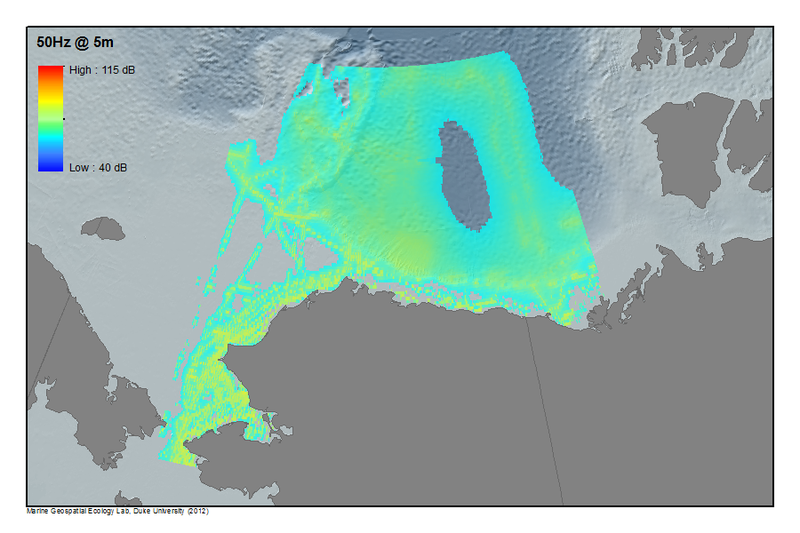 Geospatial distribution of three seismic surveys (each involving multiple operations) in the Beaufort and Chukchi Seas during a recent (2008) period of operation during the ice-free season; nominal operational parameters of airgun arrays were used as representative for all sources. Environmental descriptors1 and the distribution, density, and acoustic characteristics of commercial seismic airgun surveys2 were used to develop first-order estimates of anthropogenic noise levels for a number of discrete receiver depths and sound frequency bands. Propagation was conducted using Kraken normal node parameters (Porter and Reiss, 19843; 19854). Predicted received levels are expressed as equivalent, unweighted sound pressure level (Lzeq), which is a time-average of sound levels across a specified duration, represented in specific 1-Hz frequency bands at 50, 100, and 200 Hz (400 and 800 Hz were not modeled); 1/3rd-octave band levels centered on these frequencies were calculated from the modeled spectrum levels. The averaging time utilized considered appropriate timescales for the activities of interest, in this case the duration of each specific survey. The total energy from all surveys were included in the annual average noise layer for the Beaufort Sea. Different geospatial noise map layers are depicted for different receiver depths and frequency bins at ~10x10 km resolution (0.0924 degrees which is 10 km at the equator). Improvements in the underlying environmental parameters (e.g., ocean bottom-type data), better spatio-temporal resolution of different survey types, inclusion of the survey-specific configuration of airgun arrays, modeling at higher sound frequencies (e.g., 400, 800 Hz), and including seasons with a larger number of overlapping surveys including in Canadian waters, are seen as important progressions in improving the precision of models of the contribution of seismic surveys to low frequency ambient noise in these areas off the north slope of Alaska. 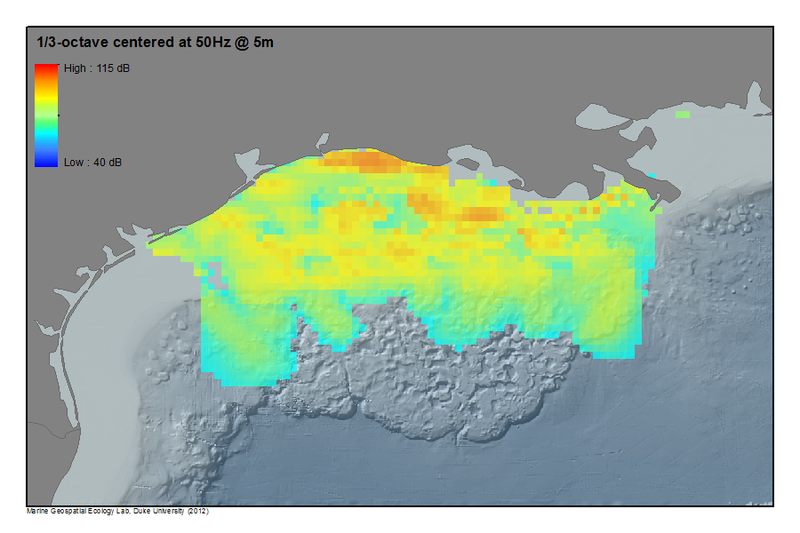 2Described in the source data methodology for seismic airgun arrays on the north slope of Alaska. 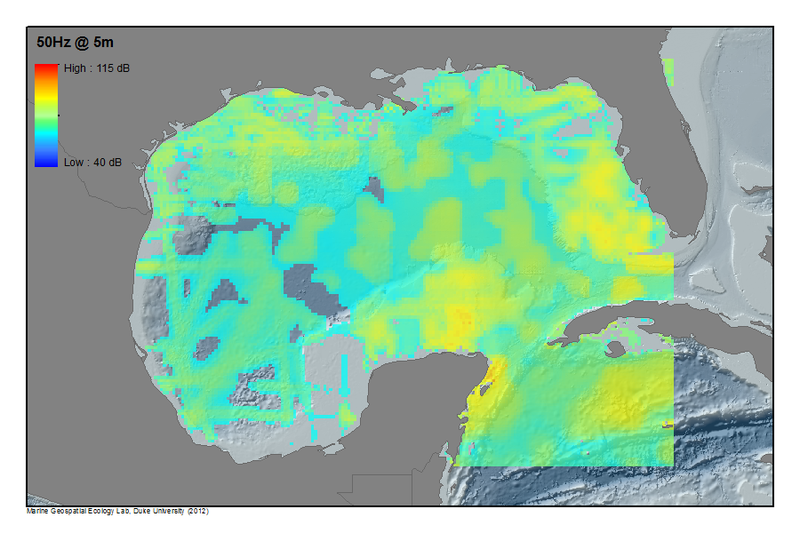 This noise layer depicts the average annual contribution of seismic surveys using airgun arrays to low frequency anthropogenic noise in the Gulf of Mexico (GoMex). Geospatial distribution of 16 seismic surveys in the GoMex during a typical operating year-long period; nominal operational parameters of airgun arrays were used as representative for all sources. Environmental descriptors1 and the distribution, density, and acoustic characteristics of commercial seismic airgun surveys2were used to develop first-order estimates of anthropogenic noise levels for a number of discrete receiver depths and sound frequency bands. Propagation was conducted using Kraken normal node parameters (Porter and Reiss, 19843; 19854). Predicted received levels are expressed as equivalent, unweighted sound pressure level (Lzeq), which is a time-average of sound levels across a specified duration, represented in specific 1-Hz frequency bands at 50, 100, and 200 Hz (400 and 800 Hz were not modeled); 1/3rd-octave band levels centered on these frequencies were calculated from the modeled spectrum levels. The averaging time utilized considered appropriate timescales for the activities of interest, in this case the duration of each specific survey. The total energy from all surveys were integrated into the annual average for the GoMex. Different geospatial noise map layers are depicted for different receiver depths and frequency bins at ~10x10 km resolution (0.0924 degrees which is 10 km at the equator). Improvements in the underlying environmental parameters (e.g., ocean bottom-type data), better spatio-temporal resolution of different survey types, inclusion of the survey-specific configuration of airgun arrays, and modeling at higher sound frequencies (e.g., 400, 800 Hz) are seen as important progressions in improving the precision of models of the contribution of seismic surveys to average ambient noise in the GoMex. 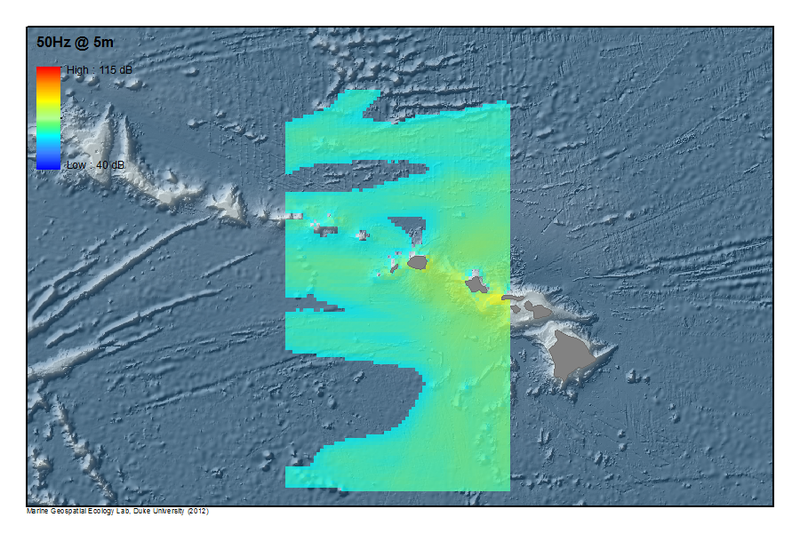 1Bathymetry from SRTM30 (David T. Sandwell, Walter H. F. Smith, and Joseph J. Becker, 2008) and ETOPO2 (U.S. Geological Survey, 2004); Sea surface roughness based on 10-knot wind speed; Seabed from NCEAS conversion of dbSEABED into “hard” and “soft” bottom types (Halpern et al. 2008); sound-speed profiles from WOA “Annual Average” (World Ocean Database 2005. 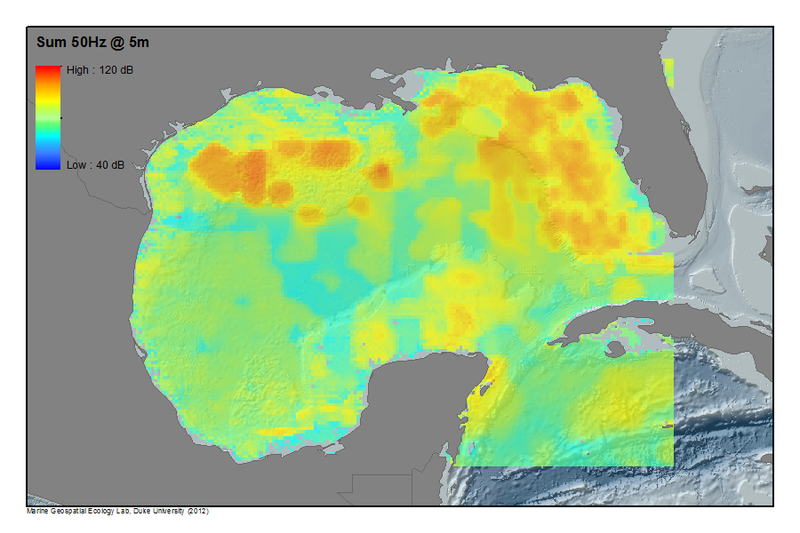 S. Levitus, Ed., NOAA Atlas NESDIS 60, U.S. Government Printing Office, Washington, D.C.); blank areas filled in with data from Database Description for Bottom Sediment (U), 2006, Naval Oceanographic Office Acoustics Division,Stennis Space Center, Mississippi. 2Described in the source data methodology for seismic airguns in the GoMex. 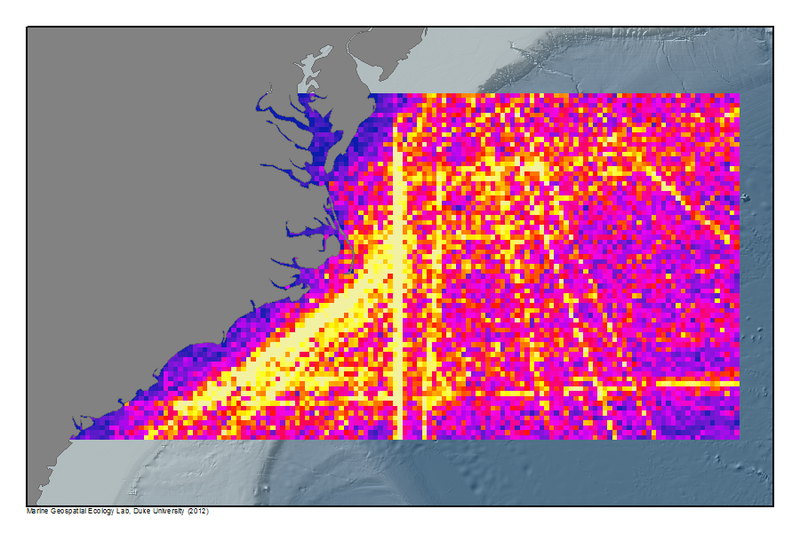 This noise layer depicts the average annual contribution of commercial vessels used to service offshore energy facilities to low frequency anthropogenic noise in the Gulf of Mexico (GoMex). 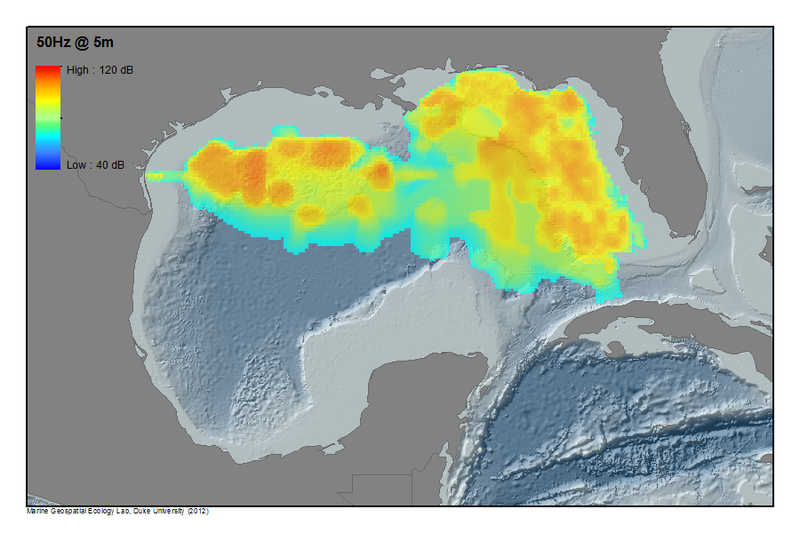 Source data on the spatial distribution and density of service vessels transiting to and from offshore oil platforms in the Gulf of Mexico (GoMex); these data were derived using a number of assumptions described in the source data methodology. Environmental descriptors1 and the distribution, density, and acoustic characteristics of GoMex offshore service vessels2 were used to develop first-order estimates of anthropogenic noise levels for a number of discrete receiver depths and sound frequency bands. A number of simplifying assumptions regarding vessel transit patterns were made in deriving a ship traffic model to predict vessel density and distribution, including that vessels visited one rig/trip, traveled in straight lines from origin to destination ports, and source levels and spectral characteristics of support vessels of several classes were broadly represented by a nominal sound source signature. Propagation was conducted using Kraken normal node parameters (Porter and Reiss, 19843; 19854). Predicted received levels are expressed as equivalent, unweighted sound pressure level (Lzeq), which is a time-average of sound levels across a specified duration, represented in specific 1-Hz frequency bands at 50, 100, and 200 Hz (400 and 800 Hz were not modeled); 1/3rd-octave band levels centered on these frequencies were calculated from the modeled spectrum levels. 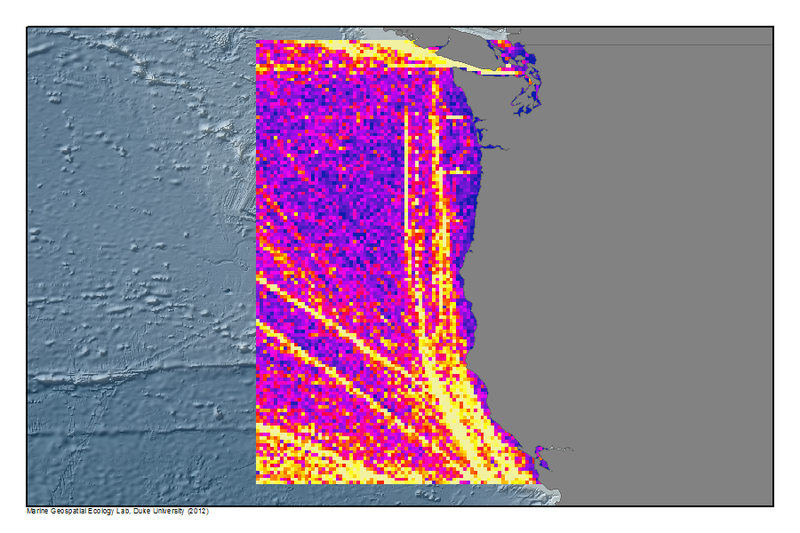 The average density and distribution of vessels from the ship traffic model was used as an annual source level density for this source type that was integrated into the average annual noise layers for the GoMex. Different geospatial noise map layers are depicted for different receiver depths and frequency bins at 0.1° x 0.1° lat-lon (~100 km2 at the equator) resolution. Improvements in the underlying environmental parameters (e.g., ocean bottom-type data), better spatio-temporal resolution of specific survey vessel types, source outputs, and routes, are seen as important progressions in improving the precision of models of the contribution of offshore energy facility service vessels to average low frequency ambient noise in the GoMex. 2Described in the source data methodology for service vessels in the GoMex. This is a modeled example of the sound fields generated by multiple seismic surveys for one of the representative SoundMap noise event scenarios. To provide an example of the sound fields generated by multiple seismic surveys for one of the representative noise event scenarios for SoundMap modeling. During the summer of 2008, up to three simultaneous seismic survey operations were taking place in different locations in the Beaufort Sea off the north slope of Alaska1. The associated activities consisted of shallow water surveys performed with relatively small airgun arrays between about 450 and 900 cubic inches, and a deeper water survey (performed at two different sites non-concurrently) with a larger airgun array of about 3000 cubic inches total volume. Airgun array directional source levels were estimated2 and spectral source levels for towing vessels were based on field data for a comparable surrogate3. Both the impulsive noise from the seismic arrays and the continuous noise from the towing vessels were modeled; the latter to provide a reference for noise in the period between airgun pulses. A propagation model that takes into account the frequency dependent acoustic properties of the signal, water column and sea bottom was used to estimate sound level fields from each source independently at finely sampled water depths. Multiple activities were combined into aggregate scenarios by adding their respective noise fields over a common spatial grid. Snapshot one-second average sound field maps for different frequencies and depths, or broadband and/or maximized over depth, show estimated underwater noise from the aggregate activities for particular periods of operations. These modeled levels are represented in specific 1-Hz frequency bands at the following frequencies: 50, 100, 200, 400, and 800 Hz; 1/3rd-octave band levels centered on these frequencies were calculated from the modeled spectrum levels. Like each of the event scenarios, this should be recognized as a first-order example of the sound footprints associated with these kinds of offshore exploration activities. Subsequent improvements in model accuracy could include finer scale definition of the propagation environment, more detailed source acoustic and motion/heading parameters, and the inclusion of distant noise from other surveys in surrounding areas (e.g., Canadian Beaufort). 1The description, location and timing of Beaufort activities were obtained from 2006-2008 Chukchi and Beaufort seas Joint Monitoring Program comprehensive report (Funk., D.W., D.S. Ireland, R. Rodrigues, and W.R. Koski (eds.). 2010. Joint Monitoring Program in the Chukchi and Beaufort seas, open-water seasons, 2006–2008. LGL Alaska Report P1050-3, Report from LGL Alaska Research Associates, Inc., LGL Ltd., Greeneridge Sciences, Inc., and JASCO Research , Ltd., for Shell Offshore, Inc. and Other Industry Contributors, and National Marine Fisheries Service, U.S. Fish and Wildlife Service. 499 p. plus Appendices.). 3Hannay, D., A. MacGillivray, M. Laurinolli, and R. Racca. 2004. Sakhalin Energy: Source Level Measurements from 2004 Acoustics Program, Ver. 1.5. Technical report prepared for Sakhalin Energy by JASCO Research Ltd, December 2004. 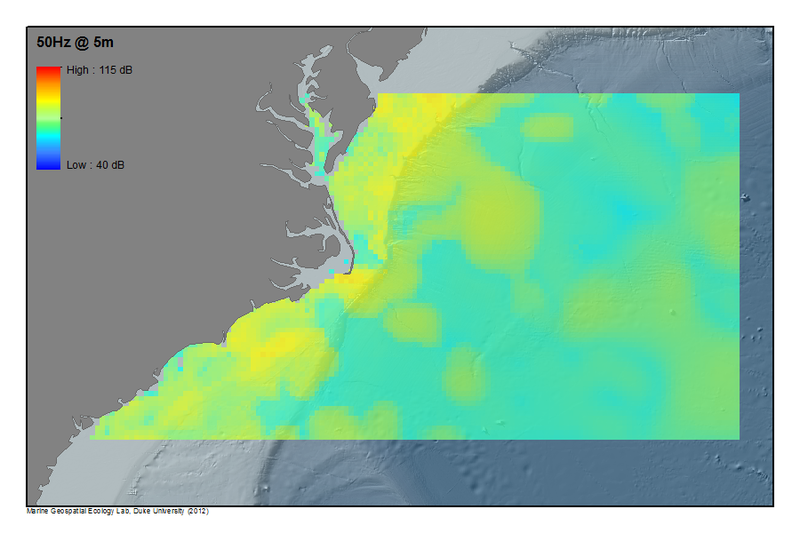 To provide an example of the sound fields generated by the installation of an offshore wind facility along the Atlantic coast as one of the representative noise event scenarios for SoundMap modeling. A commercial scale wind energy project, Cape Wind located between Cape Cod and Nantucket), has been permitted for development by the Department of Interior’s Bureau of Ocean Energy Management (BOEM). Construction on this project has not yet begun, so parameters used for the source data in this event scenario are based upon plans and reports submitted to BOEM1; these are based on the expectation that foundation installation will involve the driving of single or multiple piles with a hydraulic impact hammer. This scenario assumes 130 piles will be driven over an eight month-period and that each will take 4-6 hours to drive with 2-36 impacts per minute (a nominal 5h period with 19 strikes/hour was used accordingly). Noise modeling of facility installation focused exclusively on the high-energy impact hammer strikes with the above nominal parameters; vessel noise from support operations was not included. Pile-driving sound sources were modeled at a single depth (1m above the sea floor) using a different sound propagation model (RAM2) than was used in all other cases for SoundMap modeling. Predicted received levels are expressed as equivalent, unweighted sound pressure level (Lzeq), which is a time-average of sound levels across a specified duration, represented in specific 1-Hz frequency bands at the following frequencies: 100, 200, 400, and 800 Hz; 1/3rd-octave band levels centered on these frequencies were calculated from the modeled spectrum levels. Because of the shallow depth at the deployment site, received sounds in the water column are given exclusively at 5m and were not modeled for 50 Hz. Like each of the event scenarios, the wind farm installation event scenario should be seen as a notional example used to provide first-order estimates of the noise footprint of these kinds of offshore activities. Future improvements will include site-specific acoustic parameters of actual installation operations, increased spatial resolution, and improvements in the site-specific bathymetry data. 1The offshore wind facility installation scenario presented here is based upon filings by Cape Wind, LLC with Federal and State regulatory agencies through the environmental review process (see )http://www.boemre.gov/offshore/RenewableEnergy/CapeWind.htm. 2M.D. Collins. 1993. A split-step Padé solution for parabolic equation method. J. Acoust. Soc. Amer. 93, 1736-1742. M.D. Collins. 1993. Generalization of the split-step Padé solution. J. Acoust. Soc. Am. 96, 382-385. 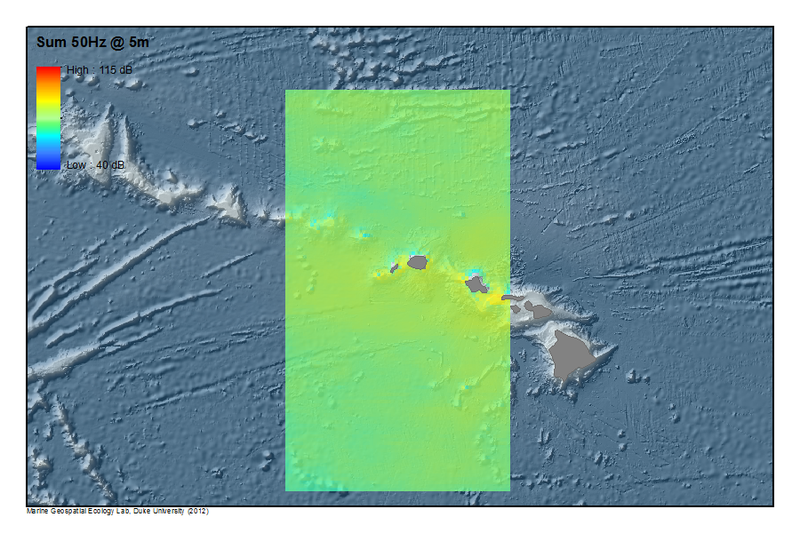 To provide an example of the sound fields generated by a typical naval active sonar training exercise in Hawai’i for one of the representative noise event scenarios for SoundMap modeling. 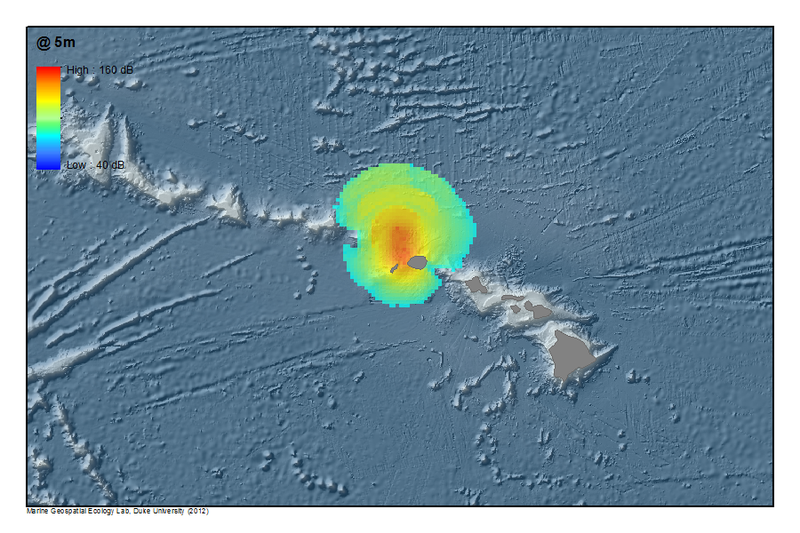 The source data used in this event scenario were derived with using the Navy Acoustic Effects Model (NAEMO) to represent a simulation of a 96-hour multi-ship sonar operation on the Pacific Missile Range Facility (PMRF) off the island of Kaua’i. For this event, sound sources from both naval vessels (including two equipped with 53C sonar, one with a 56C sonar), active sonobuoys (3 AN/SSQ-62), and helicopters (3 AN/AQS-22) were modeled. Pings at nominal source levels of 235 dB re uPa@1m (dB) for the 53C (3.5 kHz), 225 dB for the 56C (7.5 kHz), 217 dB for the AN/AQS-22 (4.1 kHz) and 201 for the AN/SSQ-62 (8 kHz) at typical rates and durations. The ships were moved along random “pool hall” tracks, which used track “bounces” off the range boundaries to determine each ship’s course. The sound field around the ships was measured at a time resolution of one second and a spatial resolution of 400m. Levels were modeled at depths of 10, 100, 500, 1000, 1500, and 2000 meters out to a range of 80 dBre: 1µPa @ 1m using the Navy Acoustic Effects Model (NAEMO)1; environmental variables used in propagation modeling were typical for Navy applications2. Like each of the event scenarios, this should be recognized as a first-order example of the sound footprints associated with these kinds of naval training exercises. It is modeled based on typical sources included with random source tracks within range boundaries and nominal transmission rate with published source levels. Actual tracks, transmission rates and output levels/patters will be dependent on test requirements and environment. Improvements in model accuracy could include finer scale definition of the propagation environment and more detailed source acoustic and motion/heading parameters for specific training operations. This layer captures the noise due to wind-induced breaking waves. The resulting noise field is often the dominant component in the 200-1000 Hz regime.